If you're looking for a great (and cheap!) hotel in Ann Arbor, CheapTickets is the best place to find them. We offer deals on the best 211 hotels throughout Ann Arbor. No matter what you're looking for, we have options for you. Grab great rates on the 75 affordable 3-star hotels that are easy on the wallet without sacrificing comfort. Looking for more luxury? Try one of the 7, 4-star hotel accommodations in Ann Arbor. No matter your budget needs, we've pulled out all the stops to make sure you have plenty of vacation options. Maybe you prefer to search for your hotel deals based on what each hotel offers? For example, let's say you just want to find a hotel or resort that has a pool to cool off in after a long day exploring Ann Arbor. Scroll down to choose from the 141 hotels in Ann Arbor that has a pool for guests. Or search for deals on Ann Arbor hotels offering free wifi or breakfast, non-smoking rooms, and more! CheapTickets is here to be your personal travel agent for your next trip to Ann Arbor. Get booking today! What hotels in Ann Arbor offer free wifi access? Are there deals on Ann Arbor hotels offering free breakfast? Yes! The only thing better than finding a great deal on a cheap hotel in Ann Arbor is finding one that offers free breakfast. Grab some eggs, a waffle, or some healthy oatmeal before a day full of exploring Ann Arbor and all that it has to offer. Below are just some of the many hotels that offer free breakfast in Ann Arbor. Hyatt Place Detroit/Livonia is a 3.00 star rated hotel property in Ann Arbor that offers free breakfast. Days Inn by Wyndham Detroit Metropolitan Airport is a 3.00 star rated hotel property in Ann Arbor that offers free breakfast. Hampton Inn Ann Arbor - North is a 2.50 star rated hotel property in Ann Arbor that offers free breakfast. Knights Inn Romulus Detroit Metropolitan Airport is a 2.00 star rated hotel property in Ann Arbor that offers free breakfast. What about deals on pet-friendly hotels in Ann Arbor? Ann Arbor is a great place to get outside and explore with your pets in tow so don't leave your furry friends behind. Below you'll find great deals on hotels in Ann Arbor that allow pets. Don't forget to bring plenty of treats! Ann Arbor Regent Hotel & Suites is a popular, pet-friendly, 3.00 star hotel in Ann Arbor. 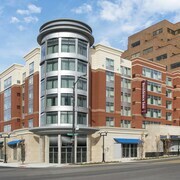 Crossland Detroit-Livonia is a popular, pet-friendly, 2.00 star hotel in Ann Arbor. 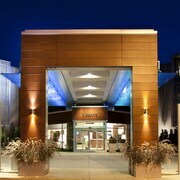 Radisson Hotel Detroit-Farmington Hills is a popular, pet-friendly, 3.00 star hotel in Ann Arbor. Red Roof Inn Detroit - Plymouth/Canton is a popular, pet-friendly, 2.00 star hotel in Ann Arbor. Any good rates on Ann Arbor hotels with restaurants? Absolutely. Don't want to deal with planning our all your meals on your trip to Ann Arbor? We don't blame you. Keep the hangry away by staying in one of the 55 hotels that have restaurants. With a room at one of these spots, all it takes to get a good meal is hopping in the elevator. Check out some of the most popular hotels in Ann Arbor that have restaurants below. Book Courtyard by Marriott Detroit Metropolitan Airport RomulusCourtyard by Marriott Detroit Metropolitan Airport Romulus is a 3.00 star hotel and has one or more restaurant options. 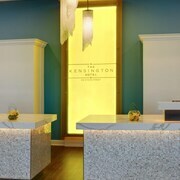 Book The Kensington HotelThe Kensington Hotel is a 3.50 star hotel and has one or more restaurant options. Book Red Roof PLUS+ Ann Arbor - U of Michigan NorthRed Roof PLUS+ Ann Arbor - U of Michigan North is a 2.50 star hotel and has one or more restaurant options. Book Detroit Metro Airport MarriottDetroit Metro Airport Marriott is a 3.50 star hotel and has one or more restaurant options. What are the cheapest hotels in Ann Arbor with pools? What's better after a long day exploring Ann Arbor then a relaxing dip in a pool? Finding the Ann Arbor hotel you need for a bargain! Cool off and unwind at one of our 141 Ann Arbor hotels with a pool. Browse some of the top deals on these hotels and resorts with pools in Ann Arbor below, but be warned: You may not want to check out! 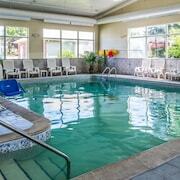 Americas Best Value Inn & Suites-Monroe has a pool and a 2.00 star rating. 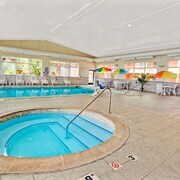 Wyndham Garden Ann Arbor has a pool and a 3.00 star rating. Comfort Inn Near Greenfield Village has a pool and a 2.50 star rating. Best Western Greenfield Inn has a pool and a 3.00 star rating. What hotels in Ann Arbor offer parking for guests? Once you've made your way to Ann Arbor, the last thing you want to deal with is finding parking close to your hotel. Avoid the hassle of parking around the block and carrying your luggage all the way to the lobby by booking one of our hotels with parking. Check out deals on some of the 169 hotels in Ann Arbor that offer parking for guests. Motel 6 Detroit NW - Farmington Hills This hotel has a 2.00-star rating. The Westin Detroit Metropolitan Airport This hotel has a 4.00-star rating. Graduate Ann Arbor This hotel has a 4.00-star rating. Howard Johnson by Wyndham Romulus Detroit Metro Airport This hotel has a 2.00-star rating. Do Ann Arbor hotels offer 24-hour concierge services? When you're on vacation, things don't always go according to plan. Travel with peace of mind when you book one of our 20 hotels in Ann Arbor with 24-hour concierge service. That way you know help is always phone call or elevator ride away. Try Graduate Ann Arbor. It's a 4.00 star rated hotel in Ann Arbor that offers concierge services 24 hours a day. Try Detroit Metro Airport Marriott. It's a 3.50 star rated hotel in Ann Arbor that offers concierge services 24 hours a day. Try Sheraton Detroit Metro Airport. It's a 3.50 star rated hotel in Ann Arbor that offers concierge services 24 hours a day. Try Hyatt Place Detroit/Livonia. It's a 3.00 star rated hotel in Ann Arbor that offers concierge services 24 hours a day. What about low rates on non-smoking hotels in Ann Arbor? The Dearborn Inn- A Marriott Hotel This hotel has a 4.00-star rating. Comfort Inn Livonia This hotel has a 2.50-star rating. La Quinta Inn & Suites Detroit Metro Airport This hotel has a 3.00-star rating. Red Roof Inn Ann Arbor - University of Michigan South This hotel has a 2.00-star rating. What are the cheapest Ann Arbor 3-star hotel deals? Our 3-star hotels bring you quality accommodations at a lower price point for the perfect, budget-friendly vacation in Ann Arbor. With 75 3-star hotels throughout Ann Arbor to choose from, you still have options. Browse our selection below. Edward Hotel and Convention Center. Shopping is across the street. This hotel is 12 miles from downtown Detroit, where the Detroit Red Wings and Lions play, and 11 miles from DTW airport. Best Western Greenfield Inn. 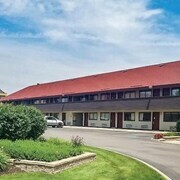 The Best Western Greenfield Inn is located off I-94 at Exit 206. This pink Victorian-style hotel is less than 3 miles from The Henry Ford Museum/Greenfield village and within 10 miles of downtown Detroit and the airport. Wyndham Garden Romulus Detroit Metro Airport. This hotel is across the highway from Detroit Metro Airport, 18 miles from downtown Detroit and Fox Theater. Ann Arbor Regent Hotel & Suites. Located in the heart of Ann Arbor, this hotel is within 3 mi (5 km) of Cobblestone Farm, Buhr Park, and Rynearson Stadium. Ypsilanti Water Tower is 3.1 mi (4.9 km) away. What are the best deals on 4-Star Hotels in Ann Arbor? Ann Arbor is full of hotels and it can be hard to narrow down where you really want to stay. Luckily, we've done that hard work for you be narrowing you from 211 hotels throughout Ann Arbor, to the 7 4-star hotels in Ann Arbor. 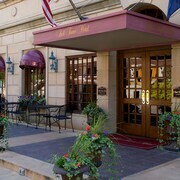 Our 4-star hotels in Ann Arbor are exactly what you need for your next family trip, romantic weekend, or solo getaway. Check out our most popular deals below. Weber's Hotel & Restaurant: Situated in Ann Arbor, this boutique hotel is within 3 mi (5 km) of Ann Arbor Hands On Museum, University of Michigan, and Michigan Stadium. University of Michigan Museum of Art is 3.1 mi (4.9 km) away. The Westin Detroit Metropolitan Airport: This quiet, ultramodern Westin Hotel is located on-site at Detroit Metropolitan Airport with a private entrance into the World Gateway Terminal, as well as complimentary 24-hour shuttle to the North Terminal; Ford World Headquarters is 8 miles away. The Dearborn Inn- A Marriott Hotel: This colonial-style hotel is situated on 23 wooded acres across from the historically themed entertainment of Greenfield Village and the Henry Ford Museum; downtown Detroit is within 12 miles. Graduate Ann Arbor: Situated in Ann Arbor, this hotel is within a 10-minute walk of University of Michigan, Ann Arbor Hands On Museum, and University of Michigan Museum of Art. Michigan Stadium and Gerald R. Ford Library are also within 2 mi (3 km). The cleanliness of the room came into question when we found some past travelers leftover food in the fridge. Otherwise it was a good place to stay, quiet, safe and convenient location. Horrible, unclean, unhelpful staff, holes in the wall, burnt light bulbs, dirty as hell! Came in for just one night to attend the UofM volleyball game at the Crisler Center. It was pretty close to it (bout 8 minute drive). Near restaurants and not too far from the highway. Room was clean and staff was very friendly. I would definitely use again in the future. The people were very nice & really doing their best, but the Red Roof Inn Plus (Ann Arbor) room and the outside of the Inn was worn from age. The air conditioner was unable to pull the moisture from the room, so all of the bed covers & our clothing were moist. We left the fan running in the bathroom, but it also couldn’t remove the moisture.